For the rest of YOU. You might recall last week’s post concerning Dr Julien Mercille (top), of University College Dublin and his report into the Irish media and the property bubble. His academic paper claims that organisations such as the Irish Times, The Independent group and RTE helped stoke, sustain – and ultimately fail to warn people about the dangers of – the bubble. Having now read the report. It wasn’t all bad news..
“Marc Coleman, the Irish Times economics editor, wrote as late as September 2007 that: ‘Far from an economic storm – or a property shock – Ireland’s economy is set to rock and roll into the century’. In fact, ‘Ireland enters the 21st Century in a position of awesome power’. Dr Mercille gives four reasons why the media may have sought to downplay the bubble and its dangers. 1) The news organisations have multiple links with political and corporate establishment, of which they are part, thus sharing similar interests and viewpoints. 2) Just ‘like elite circles’, they hold a ‘neo-liberal ideology’, dominant during the boom years. 3) They feel pressures from advertisers, in particular, real estate companies. 4) They rely heavily on ‘experts’ from ‘elite institutions’ in reporting events. Dr Mercille says because the property boom helped key sectors of the Irish corporate and political establishment, “it was never seriously challenged”. “In 2008, PricewaterhouseCoopers conducted a detailed study offering a comprehensive look at the ownership, size and concentration of the media in Ireland that illustrates the above statements. Independent News & Media (INM) is arguably the dominant media conglomerate and is listed on the Irish and London stock exchanges. During the housing bubble years, it generated annual revenues of €1.67 billion (2007 data), owned 200 newspapers and magazines, 130 radio stations and 100 online sites in Ireland, the UK, South Africa, India, Australia and New Zealand. In Ireland, it owns seven national and 17 local newspapers and 27 websites. Some of those are leading titles, such as the Irish Independent, Sunday Independent, Sunday World and Irish Daily Star. “The Irish media received a large amount of funding from property advertising during the housing boom (and, as seen above, they even became owners of property websites). Most newspapers published weekly supplements for commercial and residential property, ‘glamorizing the whole sector’, while ‘Glowing editorial pieces about a new housing estate were often miraculously accompanied by a large advertisement plugging the same estate’, in the words of Shane Ross, former Sunday Independent business editor. “Ross also shows the power of advertisers’ in influencing news content when he states that: ‘Unfavorable coverage of developers and auctioneers in other parts of the newspapers was regularly met by implied threats from property interests that advertising could go elsewhere’. “One said that because of the need for regular contact and interaction with financial sources, ‘some journalists are reluctant to be critical of companies because they fear they will not get information or access in the future’. Another said that ‘many developers and bankers limited access to such an extent that it became seen to be better to write soft stories about them than to lose access. Extremely soft stories would be run to gain access’ to them as well. Threats of legal action limited the possibility of undertaking investigative financial reporting because banks and real estate companies could easily drag news organisations into expensive legal procedures, so that ‘Very often a threat of an injunction is enough to have a story pulled’, while many legal actions by powerful individuals or corporations are ‘executed purely to stifle genuine inquiry’. 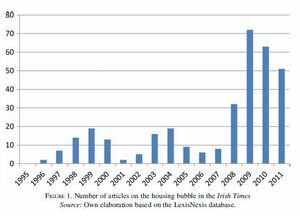 “Figures 1 and 2 show the number of articles on the housing bubble that have appeared in newspapers by year.1 The methodology used to construct those graphs consisted in identifying articles that discussed the housing bubble in Ireland. The keywords used were ‘housing bubble’, ‘property bubble’ and ‘real estate bubble’. These terms were judged to be the most appropriate ones to assess media emphasis and neglect of the Irish housing bubble. Other terms such as ‘housing boom’ or ‘housing affordability’ would have returned articles on related subjects, but would not necessarily have denoted coverage of a housing bubble, which by definition refers to abnormally inflated housing prices. For example, the phrase ‘housing boom’ has positive connotations and was often used in the media before the crash to give overly optimistic assessments of the property market. “Similarly, there have been news stories about corruption in the planning and political systems as related to housing, but those only rarely considered the fact that, at a macro level, the property market was in bubble territory. On average, the Irish Times had 5.5 times more articles on the bubble per year in 2008–11 than in 1996–2007. Similarly, the Irish Independent/Sunday Independent had on average 12.5 times more such articles in 2008–11 than in 1999–2007.3 Moreover, the few articles published during the earlier period often denied that there was a bubble. For example, Irish Times articles’ titles included: ‘Irish Property Market Has Strong Foundations’ (29 October 1999), ‘Study Refutes Any House Price “Bubble”’ (18 November 1999), ‘Bricks and Mortar Unlikely to Lose Their Value’ (11 December 2002), ‘Prices to Rise as Equilibrium is Miles Away’ (18 March 2004), ‘House Prices “Set for Soft Landing”’ (22 November 2005), ‘Property Market Unlikely to Collapse, Says Danske Chief’ (2 February 2006) and ‘House Prices Rising at Triple Last Year’s Rate’ (29 June 2006). The Irish Independent/Sunday Independent reveal the same pattern, with headlines such as: ‘NCB [Stockbrokers] Rejects House Value Threat from Burst Bubble’ (11 February 1999), ‘Property “Bubble” is Not Yet Ready to Burst’ (23 April 2003), ‘The Property Bubble Never Looked Like Bursting in County Roscommon’ (16 May 2003), ‘House Prices Not About to Fall Soon, Insist Auctioneers’ (1 June 2003), ‘Dire Predictions of Collapse in Value of Homes Dismissed’ (5 October 2003), ‘Price of Houses “Not Over-valued” Says New Report’ (19 December 2003), ‘There is no Property Bubble to Burst, Despite Doomsayers’ (27 June 2005), ‘Influx of Workers Gives Big Boost to Property’ (25 January 2006) and ‘Property “Bubble” Could Continue Expanding’ (10 February 2006). 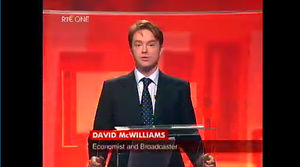 “Of course, there were some articles warning about the bubble, such as David McWilliams’ (1998) piece and those by Morgan Kelly. However, such warnings were effectively drowned in a sea of articles either denying there was a bubble, remaining vague about it or simply talking about something else. 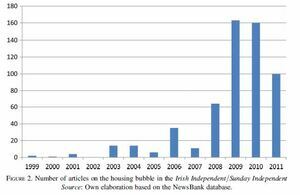 For instance, between 2000 and 2007, the Irish Times published more than 40,000 articles about the economy – but only 78 were about the property bubble, or 0.2 per cent.4 This is small coverage for what was arguably the most important economic story during those years. Articles that cautioned against the possible negative repercussions of a real estate bubble were often met with stories throwing doubts on such claims or arguing that things would be fine. For example, in 2003, an Irish Times article dampened possible worries of an overvalued property market with a story entitled ‘IMF Points to “Significant Risk” of Overvaluation on House Prices; The Irish Property Market May Be in “Bubble Territory”. Or Then Again Maybe It’s Not. Even the IMF Can’t Make Up its Mind’. “Not surprisingly, their forecast was enthusiastic. Their responses included statements such as: ‘We have an underlying economy which by any standards is good’; ‘The good times are not over’; ‘There is a lot of cash out there looking for safe homes in an economy that is continuing to grow’; with ‘capital values likely to bounce back during the course of the year, the timing is right to buy development land to catch the upswing for residential development’; ‘The broad macro economic fundamentals of the Irish economy are sound’; ‘we are in a cooling off period and not a collapse’; and ‘the commercial investment market will provide solid positive performance’. “Television followed the same pattern as the print press. During the boom, RTÉ sustained the national obsession with houses by presenting programmes like House Hunters in the Sun, Showhouse, About the House and I’m an Adult, Get Me Out of Here. expected if the boom decelerated at some point. “For example, economic consultant Peter Bacon said that the ‘housing market is well underpinned by demographics’ (27 August 2003). Fianna Fail politician Sean Fleming declared that ‘definitely, the house market is going to be very strong in Ireland for the years to come’ because of ‘growing population’ and because ‘incomes are strong’ (12 April 2006). On the same show, Shane Daly (of real estate company Gunne New Homes) said that ‘people exaggerate often the level of debt that people are getting into’. A few months later, on 18 October 2006, Marian Finnegan (of real estate company Sherry Fitzgerald) said that ‘we are looking at a soft landing’. As late as 6 June 2007, Eunan King (of NCB Stockbrokers) stated that there won’t be a crash. It was only in April 2008 that Prime Time seemed to acknowledge as fact the sharp drop in housing prices. “In April 2007, RTÉ aired a one-hour programme entitled Future Shock: Property Crash, which outlined some of the possible dangers of a drastic decrease in house prices. Even though it came several years after The Economist had clearly presented the fact that Ireland was in a housing bubble, it still generated vigorous counterattacks in the Irish media. Taoiseach (Prime Minister) Bertie Ahern denounced its maker, Richard Curran, as ‘irresponsible’ on the radio. The Construction Industry Federation, representing Ireland’s builders, said that the programme was politically motivated. 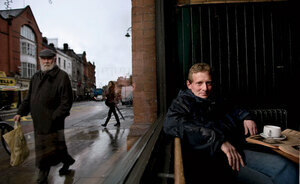 Julien Mercille is a lecturer in US foreign policy at UCD, where he moved after obtaining his PhD from UCLA. 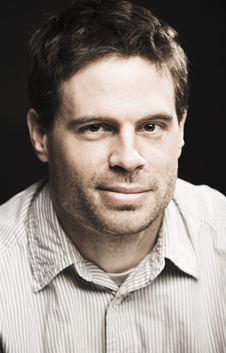 He teaches on US history and foreign policy and has published academic articles on Iran, Iraq and the Cold War, and is now researching the “War on Drugs” and Afghanistan. Posted in News and tagged Bubble, Dr Mercille, Media at 4:00 pm on April 28, 2013 by Broadsheet.